The former Shaw Street School's red-sandstone exterior is one of its more distinctive features. There's now a coffee shop where the guidance counsellor's office used to be. The lighting fixtures in the building's hallways are original. A ground-floor art installation made of clocks salvaged from the school's classrooms. It was designed by WilliamsCraig Inc.
A renovated classroom. The windows are replicas, but much of the rest is original. This artistic take on the school's crest is located in the ground-floor Urban Living Lounge. It was designed by WilliamsCraig Inc. The building's hallways and stairwells will host art installations. Pictured here is <em>Stairmasters</em>, by Seth Scriver. In 2000, when the former Shaw Street School was declared surplus by the Toronto District School Board, it wasn’t clear what would become of the century-old, heritage-designated, red-sandstone edifice. Its prime location near the intersection of Queen Street West and Shaw Street and its 75,000-square-foot floor plan would have made it a perfect place for sleek new residences, but none were ever built, and the school stands to this day. Why, exactly, is that? On Tuesday, when the building opens for the first time in 13 years, area residents, ex-students, and former teachers will find out. What made the difference in this case is that TDSB chose to sell the property to Artscape, a non-profit developer responsible for projects like the Wychwood Barns, Regent Park’s Daniels Spectrum, and Gibraltar Point. Artscape provides affordable living and working space to artists and non-profits. Doing that has usually meant working with what’s already there, rather than knocking it down. 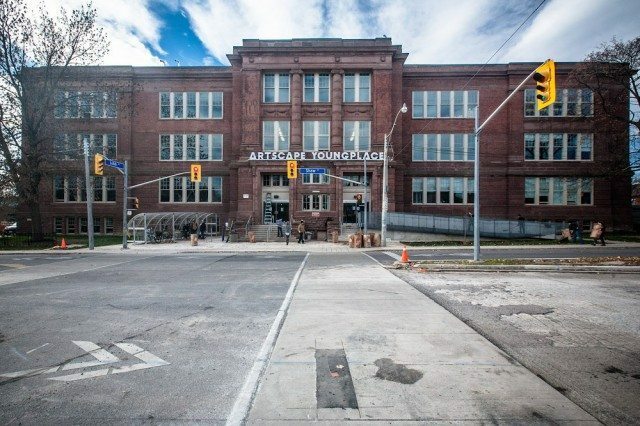 Artscape took possession of the school in 2010, and has poured $17.6 million into renovations. The building, which had been scarred by hard use (it was even pressed into service as a barracks during World War I), still looks its age, but in the way a feisty senior looks his age—which is to say, it’s well preserved. It’s now known as Artscape Youngplace. Tim Jones, Artscape’s president and CEO, seemed quietly pleased with the property’s transformation as he led reporters on a tour earlier this month. Parts of the building are still under construction, but most of it has been converted into offices, galleries, and rehearsal spaces. Some of the first wave of occupants, 27 in all, are already beginning to move in. Compared to what most of us think of when we think of a public school in Toronto, the former Shaw Street School is a cathedral. Built in 1914, it has high ceilings, long corridors, and a Beaux-Arts facade so austere that one imagines it commanding respect from even the most callow of seventh graders. Despite upgrades to the building’s mechanical systems and changes to its antique layout and structure—such as the addition of some new washrooms, so the new inhabitants don’t have to trek down to the basement, as students did—the building retains a lot of what made it distinctive to begin with. Original frosted-glass lighting fixtures dangle in cavernous hallways, and the classrooms are still recognizably classrooms, even though many of them have been subdivided. Replica windows still stretch all the way up to ceilings that look 15 feet high, and in some cases even blackboards and coat hooks remain. The building’s units have been sold or rented to individual artists for use as studios, and also to art-related non-profits like the Luminato Festival, and the Centre for Indigenous Theatre. The Koffler Centre of the Arts is taking over what used to be the school’s library. Creative people moving into a gentrifying neighbourhood isn’t the natural order of things, but that’s what’s happening. “Every other community, it’s always told from the perspective of artists as victims,” Jones said. “Inevitably, because they’re renters rather than owners, they get priced out.” But not in this case. That’s because Youngplace has inverted the condo model in an interesting way. Like a residential condo, it was financed partly with presales, which is to say that some of the renovation money came from individuals and non-profits that agreed to buy office space before construction on the building was finished. The difference is that some of Youngplace’s units were sold for below market value, under special agreements designed to give Artscape some control over how the units are resold. It’s a rare instance of the condo model being used for preservation. “It works in a residential context,” Jones said. “While the market for commercial space is less robust, we thought it would work, and it has.” Only one unit remains unsold. There are also rental units, some of which were offered at below-market rates. A special “flex space” program allows people and groups to rent workspaces by the hour. Like other Artscape properties, Youngplace will have a public face. The wide ground-floor hallway, which the Shaw Street School’s celebrated track-and-field team is said to have used as a makeshift indoor training track, is now known as the Urban Living Lounge. It will be a café-like space where members of the public will be welcomed, and where occasional events will be held. Art installations will hang on hallway walls throughout the building, and a coffee shop will sell lattes out of what used to be a guidance counsellor’s office. It may all seem a little precious, but at least it’s not another glass behemoth with a locked front door. For a closer look at the building in its still-not-quite-finished state, click through the image gallery.